Do you own a restaurant, hotel, doctor's office, dentist's office, gift shop, souvenir shop, or other business that displays brochures to the public? 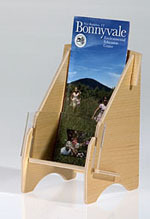 Our sturdy, attractive wooden brochure holders will adorn any desktop or countertop and present an appealing display. Made in the US from sustainable birch plywood and clear polished acrylic, most holders are in stock and ready to ship.